You can block apps if you find yourself constantly distracted by some app, for parental control or just want to play a prank on someone. This app can also be used to unblock apps that are disabled by your administrator. Type the app's file name in the Application File Name textbox (including the extension) and click Block. Right-click on the app's shortcut. The app's file name will be in Target textbox (like notepad.exe). Select the app that you want to unblock in the Blocked Applications list and click Unblock. Make sure the file name is correct and includes the extension (.exe). Restart explorer/log off and log on. 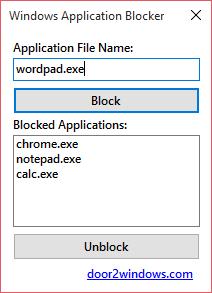 This app modifies the Windows Registry to block apps. 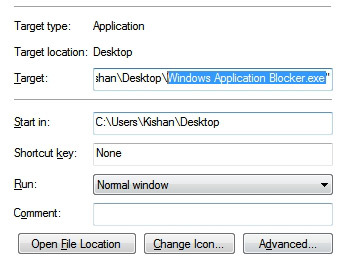 Apps blocked using this app can be easily unblocked using the Windows Registry, Group Policy Editor or simply by changing the file name of the app.